Getting connected is so important – even in a small town. Starting and running a business can be exhausting. We wouldn’t add one more thing to your plate if we didn’t believe in it 100%. 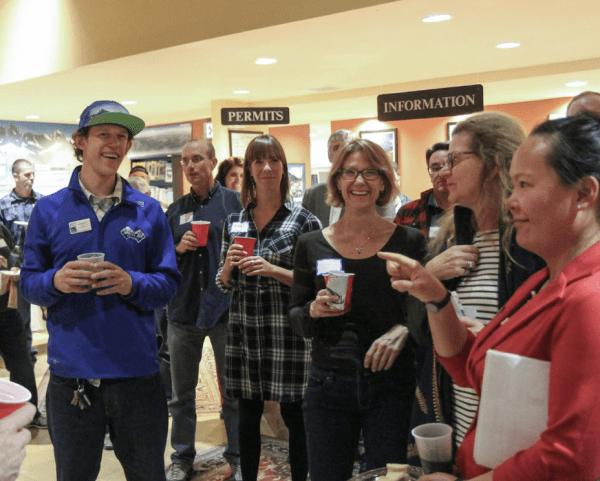 Our Business After Hours networking evenings are an easy and effective way to grow your business or grow your network as you consider starting your business. If you prefer education/professional development while networking, Power Lunch is the place for you. And if you’re too busy for either of those, grab a cup of coffee on us at our monthly Community Coffee with Mammoth Lakes Tourism. Take it from our members. Our relationship with the majority of our properties originated through the Chamber of Commerce. It's been the stepping stone for a massive amount of business relationships. We know you’ve got a lot going on, so we’ll remind you a week or two in advance that we have events coming up. There’s no need to RSVP for Business After Hours, but we do require advance registration for Power Lunch and special events. Sign up for our once-a-week email newsletter to stay up to date on our events. As a bonus, get business tips and training tools in the same newsletter.